People from all over the world have read Canoecraft by Ted Moores & Marilyn Mohr. This illustrated guide to building a strip canoe has helped many first time builders create elegant canoes. Bear Mountain Boat Shop is the company behind the book, a family business that has much to offer the strip canoe builder. 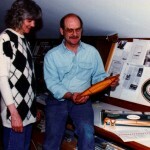 Partners Ted Moores and Joan Barrett run Bear Mountain Boat Shop with the goal of promoting and preserving the fine art of building wooden canoes. In addition to Canoecraft, they offer canoe and kayak building classes, 15 different paddle boat plans with instructions, and beautiful model canoe kits. The family enjoys working to sustain the spirit of canoe building. 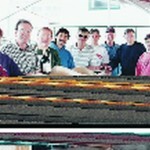 Ted pioneered an effective system for building wood strip/epoxy canoes in 1972. Since that time, Bear Mountain Boat Shop has built and restored numerous canoes and small watercraft. Ted is the resident boat builder at the Canadian Canoe Museum and is also completing a book on woodstrip epoxy kayak construction. Joan works with volunteers to develop museum products, and organizes The Skills Preservation Workshops. Whether you are seeking restoration advice for your favorite family boat, want to take a workshop, or are interested in building your own canoe or kayak, the Bear Mountain Boat Shop is the place to call. Visit their website, bearmountainboats.com. Joan and Ted sowing off their wooden model canoe kit. 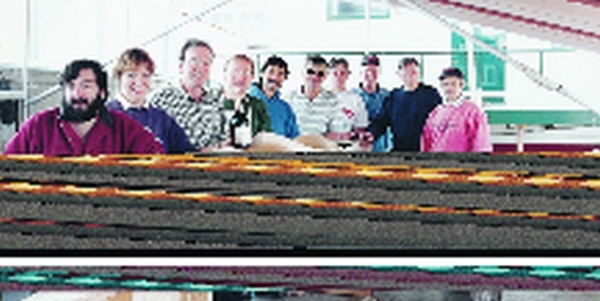 This entry was posted in Boat Construction, Wooden Boat Construction and tagged #10, Bear Mountain Boats, Epoxyworks #10, Ted Moores, Winter 1998 on July 8, 2014 by ewadmin.